The University of Wyoming Sensory Biology Center (SBC) recently received a five-year, $10 million grant from the National Institutes of Health (NIH) to advance research activities -- including exploring curing diseases -- associated with the center from 2017-2022. The primary mission of the SBC is to foster and conduct high-quality scientific research that advances the understanding of human sensory systems and disorders related to them. A major role of the center is to support and mentor the development of junior investigators of sensory system function and dysfunction. The grant, which commenced just last month, is a Phase I Centers of Biomedical Research Excellence (COBRE) program funded by the National Institute of General Medical Sciences of the NIH. The SBC is composed of Administrative Core, Integrated Microscopy Core and four interrelated research projects. -- Establish a multidisciplinary center that brings together investigators with expertise in diverse areas of sensory neuroscience and experimental methodology, and fosters collaborations to address key issues in sensory system function and dysfunction. -- Support projects of junior investigators by providing strong mentoring and guidance to help them obtain independent funding and professional success. In addition to research, investigators will be mentored on other metrics that are evaluated in tenure and promotion. The SBC has four current active projects, headed by Kara Pratt, associate professor of zoology and physiology; Stephen Santoro, assistant professor of zoology and physiology; Jared Bushman, assistant professor of pharmaceutical science in the School of Pharmacy; and Baskaran Thyagarajan, associate professor of pharmaceutics in the School of Pharmacy. -- Grow the SBC in both size and scope through the recruitment of new faculty -- four new hires total -- and foster multidisciplinary research among current UW faculty, respectively. New faculty hires will use complementary techniques and approaches to achieve the goals of cross-disciplinary research interactions, he says. Using grant funds, the SBC also plans to hire 10 UW graduate students and five full-time support staff per year, something Sun says will “make an impact” on the university. “The graduate assistants will be fully supported by the grant that will provide Wyoming students an intensified research experience,” Sun says. 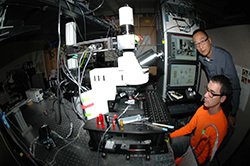 -- Build the required research infrastructure by expanding the Microscopy Core Facility. The grant will support a core facility that will combine with an existing microscopy core facility. As part of the NIH grant, the SBC will acquire new lab equipment each year. This year, the SBC will add a state-of-the-art, multiphoton microscope that comes with a $500,000 price tag. -- Advance the understanding of the development and function of sensory systems and their dysfunctions. Another activity the grant will support is a sensory biology symposium at the UW-National Park Service Research Center, located at AMK Ranch in Grand Teton National Park. Scheduled for September 2018, the event will help create a national image of Wyoming by bringing sensory biologists from all over the country and world to Wyoming every year, Sun hopes. While Sun is pleased the SBC obtained this competitive NIH grant with strong support from UW’s Office of Research and Economic Development, and the UW colleges of Health Sciences and Arts and Sciences, he is looking even farther down the road, eyeing subsequent Phase II and Phase III NIH grants that would add another 10 years of funding to the tune of $20 million.